142 pages | 6 B/W Illus. 'The members of Rethinking Economics haven't just protested against the narrowness of the conventional economics curriculum, they have done something about it. This volume admirably addresses their need for excellent up-to-date expert accounts of a range of different approaches to economics, all with student input.' — Sheila Dow, Emeritus Professor, University of Stirling, UK. ‘Economics students have been short-changed by degrees that teach only Neoclassical economics despite its failures before, during and after the crisis. This book provides a useful introduction to alternative voices in economics at a time when, though none of them has all the answers, they are each at least posing questions that the mainstream failed to even consider.’ — Professor Steve Keen, Kingston University London, UK. 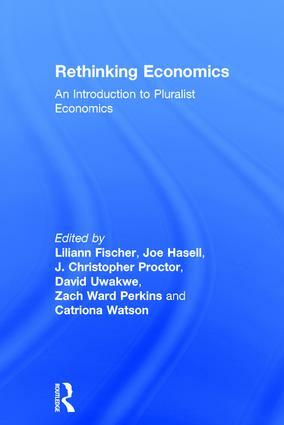 ‘A timely and informative guide to competing schools of thought in economics. An excellent starting point for students looking for a broader economics education.’ - Dr Jo Michell, Senior Lecturer in Economics, UWE Bristol, UK. ‘Is there life beyond mainstream economics?’, you ask. Well, here is your answer: nine approaches, clearly explained by top specialists in each approach. This book produced by members of Rethinking Economics is warmly recommended.’ — Victoria Chick, Emeritus Professor of Economics at University College London, UK. Epilogue: What is Rethinking Economics and how can you get involved? Liliann Fischer has an International Relations background, recently graduating from her first Master’s degree in Global Conflict and Peace Processes at the University of Aberdeen and is now studying for a second degree in Political Psychology at the University of Kent, UK. Joe Hasell graduated in Philosophy, Politics and Economics (PPE) from the University of Oxford. Following a recent Masters in Economics and Finance at the University of Naples Federico II, Italy, he has just begun a PhD in Ecological Economics at the University of Leeds, UK. J.Christopher Proctor studied Economics, History and Politics at the University of Tulsa before doing the EPOG Master's program at Kingston University, London and Université Paris 13. He is currently an Associate in Pluralist Economics for oikos International. David Uwakwe became involved with Rethinking Economics while studying Political Economy at Kingston University, London. Since graduating, he has been working as a freelance journalist and is currently living in his native Dublin. Zach Ward-Perkins is a former PPE student at the University of Manchester and a co-founder of the Post-Crash Economics society. Zach is one of the co-authors of The Econocracy: The Perils of Leaving Economics to the Experts. Catriona Watson is a former PPE student, Head of Campaigns at Rethinking Economics and co-founder of the Post-Crash Economics society. She is now studying for a postgraduate degree in Economics at Leeds University, UK.